These consist of metal brackets that are attached to the front surface of the teeth and thin metal wires held in place with elastics. Brackets are now generally smaller than they once were and they can also be customised with coloured elastics. More discreet fixed braces are also available featuring ceramic brackets and tooth coloured wires. 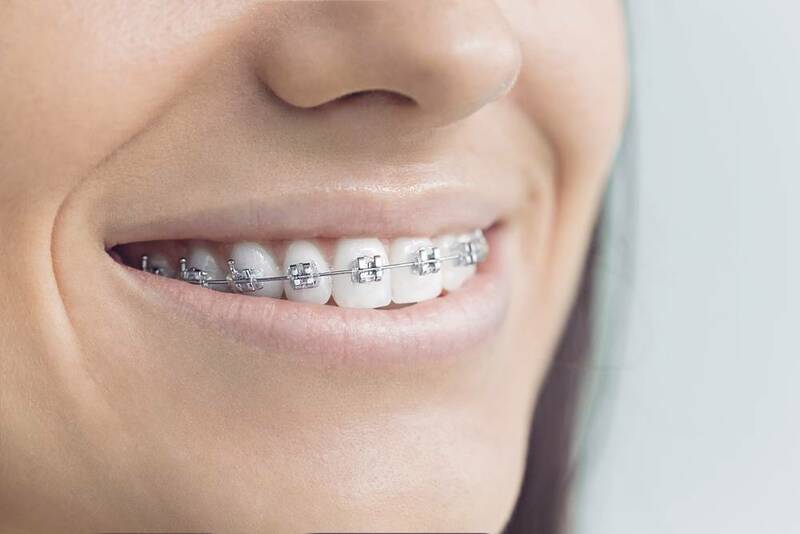 These are the most commonly used braces and are suitable for a wide range of conditions. They produce good results because they can move teeth very precisely. Fixed metal braces can be provided as an NHS treatment option to children under the age of 18. You will be able to customise the metal brackets with multi-coloured elastic bands for that extra personalisation. If your teeth are overcrowded, it may be necessary to remove one or more teeth prior to your brace fitting. If there is not enough space between teeth, bands can be inserted to create sufficient gaps. After your teeth have been cleaned and dried, brackets will be fixed in place with a strong dental adhesive. The wires are then attached to these brackets. The wire is shaped to encourage the teeth to move and, as it slowly returns to its original shape, it pulls the teeth with it. Initially, it moves the crown of the tooth and then goes on to move the root. Adjustments will be needed every 4-6 weeks. Some people can experience a little discomfort during orthodontic treatment, particularly in the first few days after fitting or following a tightening appointment. Paracetamol or ibuprofen can ease any soreness and it may help to stick to a soft diet during this time. Treatment times vary depending on the patient, but it normally takes 12-24 months for fixed braces to realign teeth. Following treatment, you will need to wear a retainer to keep your teeth in their new position. It’s incredibly important to keep your fixed brace squeaky clean during the treatment. Plaque and tartar have been known to cause the braces to stain, which is the last thing you want! It is easily avoided by cleaning thoroughly after meals using a special brush and a small amount of toothpaste. We provide interdental brushes that can reach around the brackets and under the wires as bits of food debris are notorious for getting stuck in these hard-to-reach areas. We understand that accidents happen so if you do manage to break your brace, get in touch.